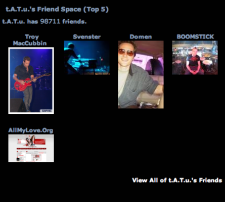 07/29/2009: "AllMyLove.Org added to t.A.T.u.’s top friends"
Our website has been added to t.A.T.u.’s top friends on MySpace.com. I received an e-mail from t.A.T.u.’s press manager, Zhenya Voevodina, stating “We’ve added your myspace as the fifth friend. Your site deserves it.” Thank you very much, Yulia Volkova, Lena Katina, and of course - tatu.ru. Thank you, guys. I have received so much recognition for this fansite. It has become overwhelming. Congratulations!!!!! :D you truly deserved it! Oh wow thats pretty damm cool u rly do deserve it though this site is sweet as i love it im always on here to find out wats new with our girls :) good work Amanda keep it up!!! Congrats Amanda, your site is awesome. nice job! some serious congrats r in order! dude that's freakin rad!!!!!!!!!!!!!!!!!!!! you're site is the bomb dot com and its definately my favorite so i can totally see how they added you to their top friends! totally deserve it! congratulations! that's freaking awesome, u deserve it! Concratulations! This site absolutly deserves to be added as a friend! Its one of my favorites!